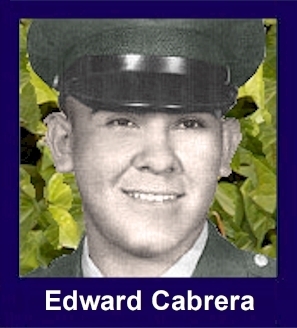 The 35th Infantry Regiment Association salutes our fallen brother, PFC Edward Albert Cabrera, who died in the service of his country on June 5th, 1967 in Quang Ngai Province, Vietnam. The cause of death was listed as Booby Trapped 250 lb Bomb. At the time of his death Edward was 19 years of age. He was from Gallup, New Mexico. Edward is honored on the Vietnam Veterans Memorial at Panel 21E, Line 57. The decorations earned by PFC Edward Albert Cabrera include: the Combat Infantryman Badge, the Purple Heart, the National Defense Service Medal, the Vietnam Service Medal, the Vietnam Campaign Medal and the Vietnam Cross of Gallantry with Palm Unit Citation. Dear Eddie: I still remember that day in the spring of 67 when you were sitting on that stool in Ferrari's Pool Hall. You were laughing and happy and jiving us all. You told us that you were on your way to Viet Nam. The next time we heard anything, it was that you were dead. LIttle did I realize that I, too, would serve in that war. They say one is never truly forgotten until someone forgets to say your name. I always think of you and hope you are doing well in Heaven. God Bless you and the other Vets.welcome home, brother. It was a sunny, hot, very humid day and we were on a patrol and crossed over a bridge on Highway 1 in Quang Ngai Province. I was in the rear part of the mission and as the front part of the formation crossed the bridge it was blown up. Found out later that a 500lb dud bomb had been moved below the bridge and a hand grenade was set next to the bomb with a see through filament line was tied to the pin on hand grenade. The pin was pulled from a nearby tree line (150 yards away).